RUSH: I want to call your attention to something. 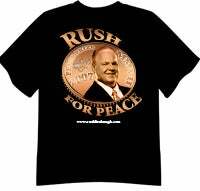 We’ve linked to this at my website, www.RushLimbaugh.com. A man by John Berlau has written an open letter to the Nobel Peace Prize committee in Oslo. Let me tell who he is. He is director of the Center for Entrepreneurship at the Competitive Enterprise Institute. He is the author of ‘Eco-Freaks: Environmentalism is Hazardous to Your Health.’ It’s a long letter. I printed this out. It’s seven pages. I can’t begin to read the whole thing to you, but he makes the case in this open letter to the Nobel Peace Prize committee, actually the chairman of the Norwegian Nobel committee, that I am far more qualified for this year’s Nobel Peace Prize. I have been nominated, for those of you just tuning in for the first time. I am a Nobel Peace Prize nominee for this year’s prize. It’s handed out in October or November. Algore is the odds-on favorite right now, but the purpose of Mr. Berlau’s letter is to suggest to the Nobel committee that I am far more worthy of this august award than Algore could even hope to be. He cites as one of his primary examples my ongoing crusade for the last ten to 12 years to discredit Rachel Carson and to get DDT back in production. The banning of DDT has led to increased cases of malaria in Africa, and Gore has not spoken up about this. It’s a great, great letter, and it’s at RushLimbaugh.com right now if you would like to just go and check it out when you have time, because as I tell you, it’s much too long here for me to read to you in its entirety.